That is also how I look when I found out I have like 6 modules worth of final assignments due one after the other (except for the feeling happy part of course). Anyway, this process post will be pretty short and simple. Once again my project theme is cat with half the artworks classified under “A Reflection of Me” and the other half under “A Reflection of Cat”. 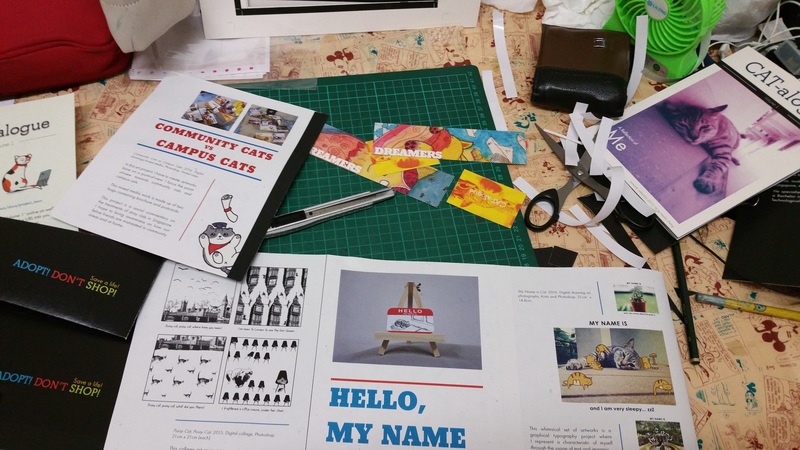 This zine will be inspired by indie cat magazine in terms of compositions and layout. Bold use of negative space will be employed. Unless Project 1 and 2 where there are a lot of crazy extras, this time it will be slightly more tame. That’s not to say there aren’t any surprises though. I always feel that when encountering a 2D project, instead of designing said object in the brief, I feel that we are actually designing user experience. And everything that I do should in the service of those experiences. Here is how the original cover look like, it is Unker Robbie from canteen 2! 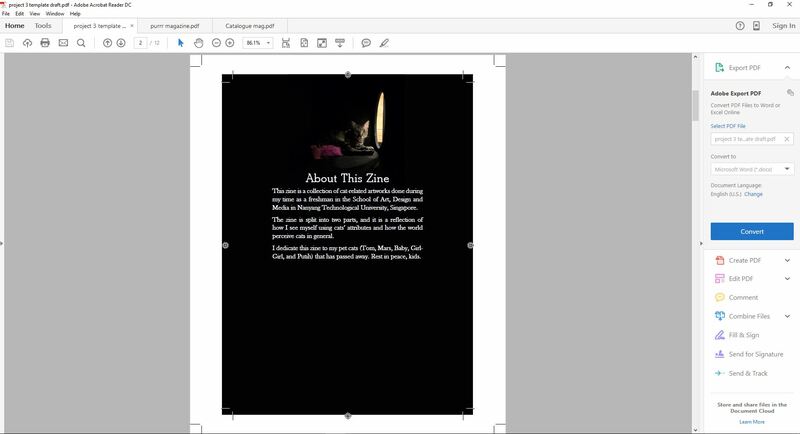 I wanted both front covers to each have their own unique photo but decided against it after the test print. 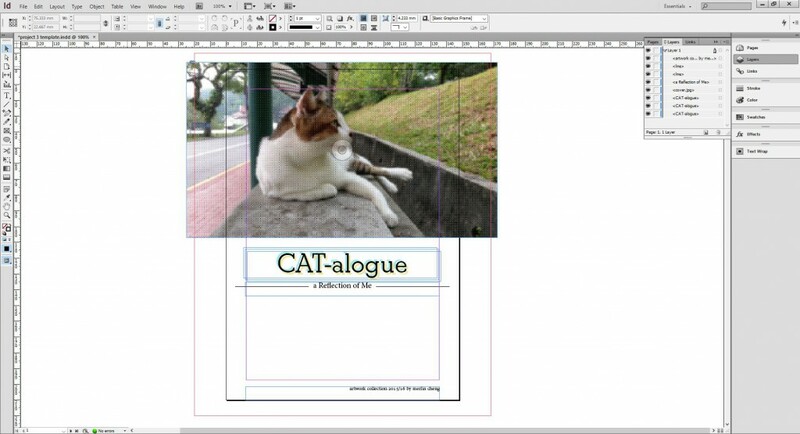 These are the WIP that I did in InDesign. I have decided to keep things simple but using more colors (such as on the title), particularly primary colors, to make the reading more expressive and to maintain the playful tone. The test printing was really helpful in determining the problems before printing the final copy. 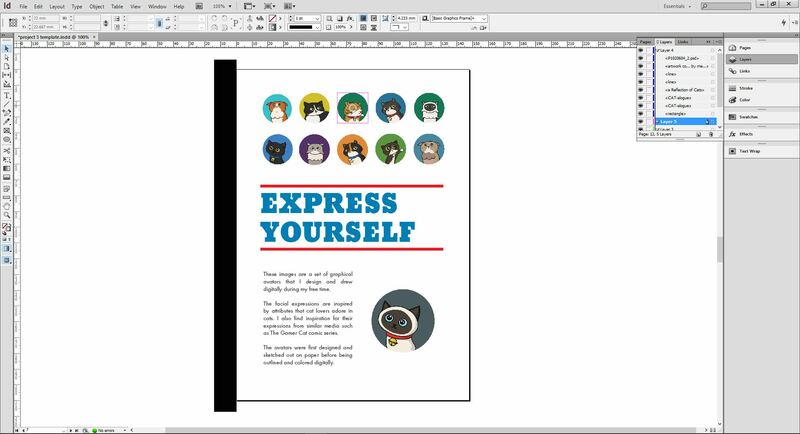 As I was rushing for the test print before the consultation, I used placeholder text instead of the final text. It was still useful as it gave me insights on what needs to be edited and changed. One of them was switching the body font to Futura (a variation of it) instead of some serif font as the weight of the stem at one side of the type make it very hard to read, especially on those with black background.